Today's Choghadiya timing for Mumbai, Ahmedabad and New Delhi is given below showing auspicious shubh muhurat. You can also view choghadiya in Hindi & Gujarati. For more information, try the Hindu calendar, Gujarati calendar and panchang. To find choghadiya for Pune, Jaipur, Vadodara or any city on any day, use the form below. Choghadiya (चौघड़िया / ચોઘડિયા ) is an Indian astrology based muhurat or auspicious time guide. Choghadiya divides day and night into 8 equal periods starting from sunrise to sunset for day choghadiya and sunset to sunrise next day for night choghadiya. In vedic astrology calculations, time is calculated in 'Ghadi'. Each ghadi is equvalent to 24 minutes. The word Choughadiya is derived from the hindi words "Chaw - चौ" meaning 'consisting of four' and 'ghadi' as each choghadiya is roughly 96 minutes duration. Amrit, shubh, labh and char are good choghadiya (except when overlapped by vaar vela, kaal vela or kaal ratri) and udveg, rog and kaal are bad choghadiya and should be avoided. 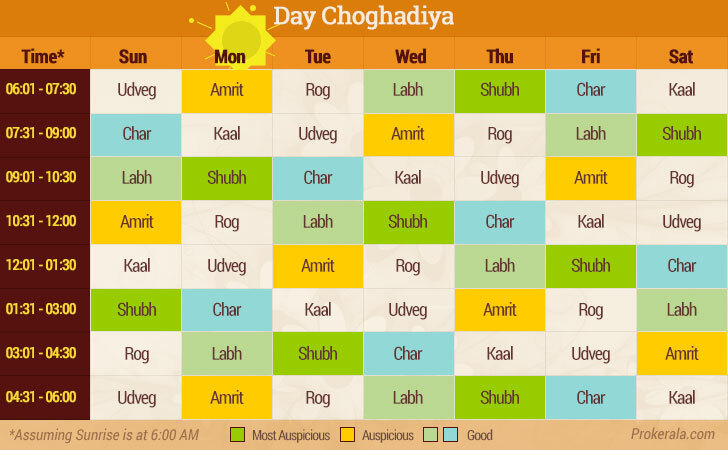 Day choghadiya (din ka choghadiya) for days of the week assuming sunrise to be at 6:00 AM. 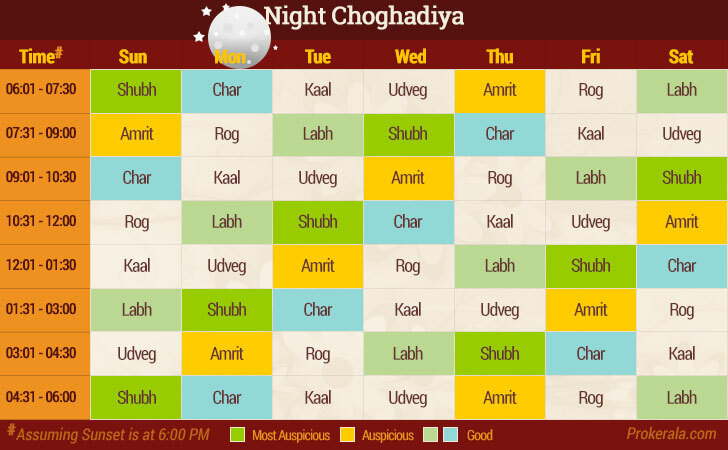 Night choghadiya (raat ka choghadiya) for days of the week assuming sunset to be at 6:00 PM. Relatively popular in north India, especially in Gujarat, Choghadiya is reliable and astonishingly accurate in determining muhurat. Its simplicity makes it more user-friendly and helps in identifying muhurats even without the help of a jyotishi or an astrologer. Gowri Panchang or nalla neram, a similar version of this calendar is popular in south india, especially in Tamil Nadu. Video:Taimur Ali Khan's love for dinosaurs is unmissable!